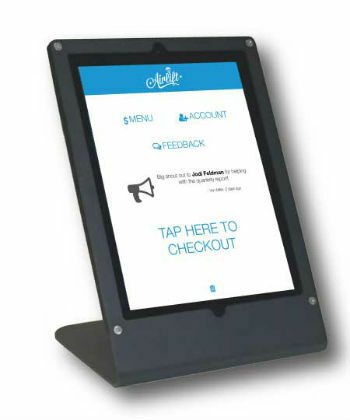 (PRLEAP.COM) BELLEVUE, WA (April 11, 2016) – Airlift introduces their iPad kiosk for micro markets this week in Booth 1723 at NAMA One Show in Chicago, and it's already turning heads. Outreach before the show drew strong interest from operators across the country. "When they hear about our approach and technology, experienced micro market operators want to get involved and learn more," says Sandeep Phadke, Airlift's founder. "We have done a lot of work to get to this point." NAMA Special Offer Sparks Interest "Our NAMA OneShow special deal to operators is to run your first market at just 2.9% of sales. You'll be able to configure a kiosk in our booth, buy it for $799, and take it with you," says Phadke. The special deal of 2.9% sparks interest for the show, but it's compelling that their regular fee structure keeps Airlift below any other micro market solution. This lighter footprint widens the opportunity for micro market installations and offers faster ROI. Founded on Technology Expertise Founded in Bellevue, WA in 2014, Airlift is a technology company focusing on office micro markets solutions. "Our experience is with technology and software, but we've become innovative vending operators, too. We operate directly about a dozen local micro markets to gain valuable feedback and insight," Airlift co-founder Minda Brusse remarks. "We unlocked the micro market opportunity with professional offices at sizes from 60 to 200, but there's really no upper end on the scale. Operators across the country can replicate what we've done to expand their business." Part of Airlift's success is capitalizing on the rising interest in micro markets that go beyond 'pay-for-product' with minimal engagement for repeat customers. Built for Offices to Love With their corporate backgrounds leading teams in the world of high-tech, Phadke and Brusse empathize with smaller companies competing every day to keep their workforce engaged, collaborating, fueled and rewarded. Airlift serves these companies and employees with features extending into rewards and recognition, fresh food programs, feedback channels, and office-friendly branding. Recognizing that HR managers will invest in employee engagement tools and programs, Airlift continues to expand on what micro markets can deliver. Founded in Bellevue, Washington in 2014, Airlift has built the most office friendly micro-market platform, to date. Airlift actively seeks experienced Office Coffee Service (OCS) providers and vending operators across the US to partner with us and offer Airlift at their office accounts. Founder and CEO Sandeep Phadke held senior roles at Microsoft and Amazon before founding Airlift. Co-founder Minda Brusse began her career at Accenture as a high-tech industry consultant before becoming involved with a series of start-up tech companies. She brings experience in retail management, program management, and software product development. Connect with Airlift at their website at http://www.viaairlift.com or by email at hello@viaairlift.com. Follow us on Facebook, Twitter and LinkedIn.